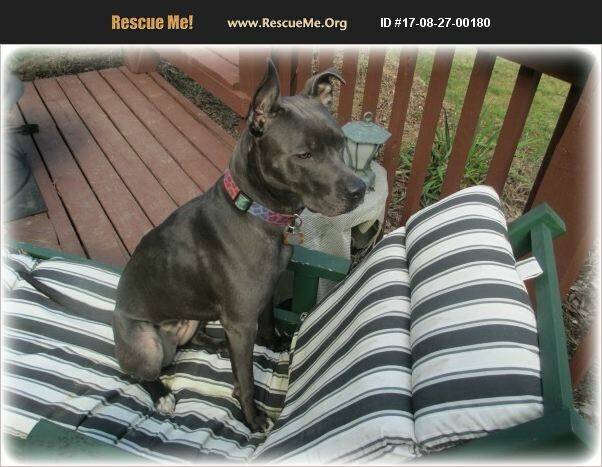 Ohio American Staffordshire Terrier Rescue View other American Staffordshire Terriers for adoption. Hi my name is Midna. In October of 2016 at age 1�%BD my current Mom rescued me with all my baggage. She has worked diligently with me and has made great strides. I am an extremely intelligent girl and a great sleeping buddy. If you are familiar with the breed, most of us do not grow out of the 'puppy stage' until around the age of six. I am still full of a lot of energy. At my Mom's stage in life, she is more suited to the mature dog that is content to lie around. She has done her best to apply the 'tired dog is a happy dog' but she wears out long before I do. She has offered a lot to enrich my life to this point and she believes it is not fair to me for her to continue as my caregiver. This is not a knee-jerk decision and is extremely heart wrenching for her. I am in need of a person who is physically stronger, lives a more active life and is capable of maintaining and continuing my training. I need someone new who is able to give me a loving and structure environment. I am spayed, micro-chipped, licensed, and current on vaccines. Midna's Mom here. I will be transparent and honest with anyone interested in her and expect them to be the same with me. I will do a home check. Adoption application required before re-homing. I will transport within a reasonable distance. Contact 614.441.3820.